Did you know you can now order your Deliveroo takeaway from Iberia Georgian Restaurant here on View? Iberia Georgian Restaurant offers a variety of authentic Georgian cuisine and drinks. Do you work at Iberia Georgian Restaurant? What did you think of Iberia Georgian Restaurant? What a great place! Had a lovely meal, dumplings were very tasty. If I wasnt so full I would have tried the desserts. Kate was very friendly and made me feel very welcome. Would recommend to anyone. We totally enjoyed our experience at Iberia Georgian. 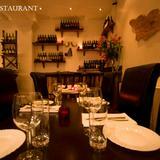 The dishes were wonderful, the service impeccable and the wine list was intriguing with well selected offerings. We tried the Saperavi, an elegant and full bodied red. The dumplings and also the beef stew were flavorful and the appetizers of mushrooms (one dish) and spring rolls were very satisfying. The complimentary spinach/aubergine amuse bouche was also expertly prepared. The bill was easy on our pockets - a great evening at this small (20 seat) gem. 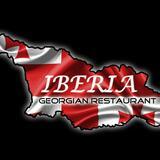 I went to Iberia on Saturday nigth without reservation and was seated rigth away. But after 10min the restaurant was full. To be safe you may have to call ahead. The decor is great! Every dish has very distinetive and unique flavor. Highly recommend the Shashlik. Lots of stuff for a Vegans that are all tasty. Ajapsandali was also my favorite. Delicious! The service is wonderfully attentive. Everything was unbelievably good and hopefully I will be back soon with a small group of friends, so we can sample even more of their great food and wine. Ady. I spent last summer in Tbilisi and I've been hankering for Georgian food ever since. This place serves up extremely good Georgian fare. The badrajani (smoky chargrilled aubergine with walnut paste and pomegranate seeds) were as good as any I've had in Georgia. The khachapuri was excellent. The mtsvade is also highly recommended, and the ajapsandali, and the chkmeruli. Excellent food. Good service. Highly recommended. This place is absolutely fantastic. A real surprise on Caledonian Road. Great decor, and an exceptionally friendly host that's delighted to talk about Georgian food and culture. A real treat from start to finish, and reasonably priced. They do some great Georgian wine too. The food is delicious. My girlfriend was concerned that there may be too much emphasis on meaty, bready dishes, and while these are certainly there if you want them, there are a great number of superb lighter dishes. Highly recommended, and a must if you live in the area. Go to Russia and you’ll hear everyone raving about Georgian cuisine. Come to Iberia in Islington and you’ll understand why. Iberia presents itself as a nondescript restaurant, nested in between other small restaurants and convenience stores. The outdoor patio is all brown and neat lines, furnished with minimal wooden furniture. 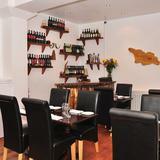 Indoors, the venue is split over two levels, both furnished with padded high-back chairs and rectangular wooden tables. If it wasn’t for the horn vessels on from the walls, there would be no reminder of the remote provenance of the food. A few more bits of paraphernalia or old photographs would add character to this understated space. Iberia is a quiet restaurant, but not void of atmosphere. The local music in the background is varied and enjoyable and the customers - couples, small groups of local and a few homesick Georgians - appreciate the relaxed environment. The service is discreet and almost invisible. Staff, seemingly hailing from Georgia, are wonderfully attentive but won’t be interacting with you unless needed. Don’t be fooled by the name. Iberia is the ancient name of Georgia, a recent country born from the ashes of the USSR. If you expect chorizo and tortillas, you may be disappointed but you should give Georgian cuisine a chance since it is just as good if not better than Spanish. Wedged in between the Caucasus and the Middle East, Georgian cuisine fuses successfully both influences in what was once described as “table scraps from Heaven” and the name and fame are both well deserved. 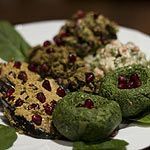 The key ingredients are walnut, aromatic herbs, garlic and pomegranate grains, distributed in a menu including cold starters (£4 - £7), hot starters (£4.50 - £7), soup (£5.50), mains (£7 - £14), extras (£1.50 – “3.50) and desserts (£3 - £4). The badrijani (roast aubergine in walnut sauce and spices with pomegranate seeds) and the kuch machi (beef giblets with walnut and pomegranate seeds) are both perfectly cooked and wonderfully spiced. The first is also lusciously oily, while the latter displays a prowess in cooking meat since the giblets are amazingly tender. The lobio is a very typical dish. The red beans, steamed with Georgian spices and served in an earthenware pot, are smooth and comforting and at the same time full of delicately spicy flavour. The chakhohbili (chicken braised in tomato, fresh coriander and spices) is excellent although the ratio between the meat and the wonderful pan fried baby potatoes it comes served with should be turned the other way around. The spices - much smoother and creamier than Indian or Middle Eastern spices - are fantastic. You’ll get a world of flavour without burning your taste buds since dishes are never more than mildly hot. The desserts are more European. The medoki is an hybrid between chocolate sponge cake and honey and condensed milk pudding, while the walnut rolls resemble French pastry although heavier. Other positive surprises are the dense white corn bread and the traditional adjika, thick spicy sauce ideal to accompany most dishes. With no other country represented, Iberia is possibly the best venue in London to taste some excellent Georgian wine. There are fifteen types of white and red (£13 - £37 for a bottle and £5 - £7.50 for a 250 ml glass). Other specialties are the borjomi Georgian sparkling water, the tarhuna tarragon lemonade (which is bright green with an unusual, pleasant taste) and Georgian and Armenian brandies. The mains are slightly overpriced, especially when you compare their size with the generous starters. However, you shouldn’t be put off by the cost. Iberia provides a cultural gastronomic experience not to be missed.